Use the site search bar above or click on a category below. Find the person of your choice to donate towards individual fundraising goals. Each voluntary ticket donation of $10 will receive one ticket entry into our sweepstakes drawing for a chance to win $500, $1000, or $10,000. See official rules below. Need help placing your online ticket donation? Call 859-485-3800 ext 2. Each sweepstakes donor, by virtue of making a donation(s) and/or participating in the sweepstakes, is deemed to have consented to having his/her identity disclosed to the student, family, or church official that donor has elected to sponsor, unless at the time said donation is made, the donor specifically instructs Assumption Church not to disclose such information to third parties. Identifying information is limited to the donor's name and address. 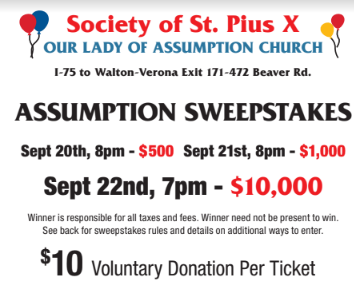 These Official Rules are subject to change at any time, at the sole discretion of Assumption Church, with or without notice to donors and other participants.